The Green Submarines of TITSA Await You! And I like their joke - green submarines - for the deep sea carnival. As they say, "We are prepared for the carnival immersion!" 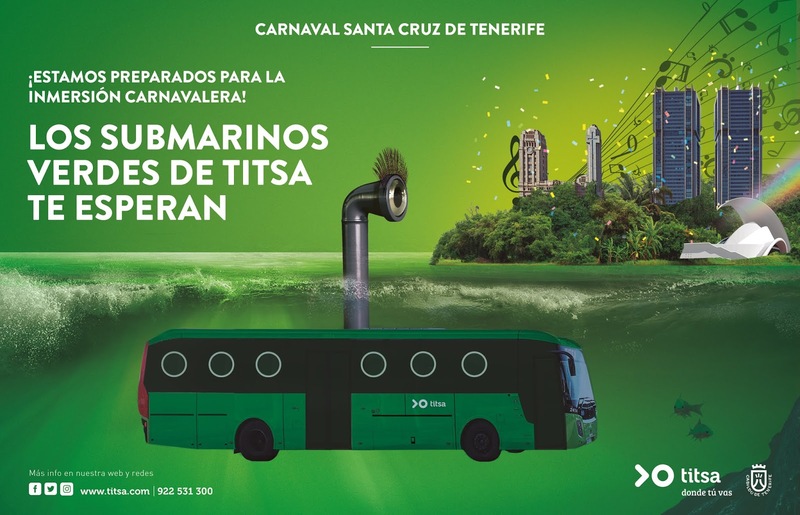 Tenerife's public bus company, TITSA are launching a special reinforcement service for the Carnival of Santa Cruz de Tenerife, which will increase the number of places available to travel by bus by 262,000 and will make 2,832 additional trips between March 1 to 10. There are special services on lines 014 and 015, which connect Santa Cruz de Tenerife with La Laguna, on demand. 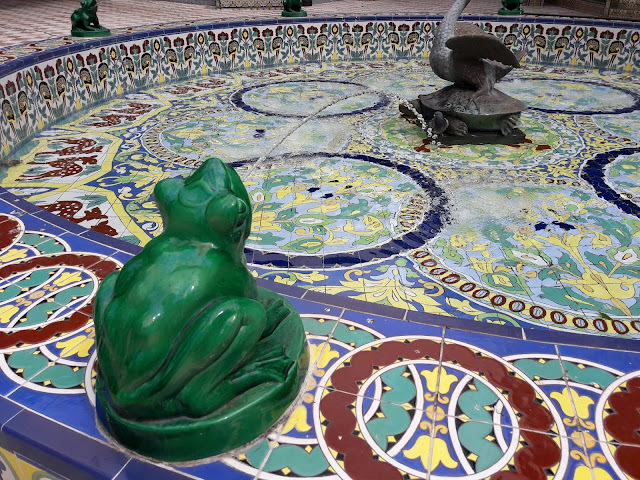 The company has agreed to implement night schedules in 17 routes that connect Santa Cruz de Tenerife with different points of the island. This reinforcement affects route 910, which will offer two early morning trips from San Andrés, as well as several routes that connect the capital with Puerto de la Cruz, Costa Adeje, Icod, Güimar, Candelaria and Punta del Hidalgo, as well as other urban lines. The service on several routes to the capital will be increased during the Daytime Carnival and Coso (Main Parade), especially 102, 103, 104, 108, 110, 111, 120, 906, 908, 935. In the evening hours, routes 102, 103 and 104 (Santa Cruz-Puerto de la Cruz), 110, 111 and 711 (Santa Cruz-Costa Adeje), 106 (Icod-Santa Cruz), 014 and 015 (Santa Cruz- La Laguna), 121 (Santa Cruz-Güimar and Puertito), 122 (Santa Cruz-Candelaria), 050 (La Laguna-Punta del Hidalgo), as well as the urban lines 232, 908, 910, 933, 934 and 972 . The routes running on March 3, 5 and 9 (Daytime Carnival and Coso), will run on the normal weekday timetable, plus reinforcements. With this programming, the TITSA company seeks to become a reliable, comfortable and safe alternative for travel from any part of the island during the celebration of Carnival, ensuring easy access to Santa Cruz. The Intercambiador de Santa Cruz de Tenerife will remain operational 24 hours on the 1st, 2nd, 4th, 8th and 9th of March, and until 02:00 hours on Tuesday 5 and Wednesday 6 of March. The car park of the Intercambiador de La Laguna will remain operative all night of 2, 4 and 9 of March and until the 02:00 hours, the Fridays 1 and 8 of March. The car park at the Santa Cruz de Tenerife Interchange has a special rate for weekends and holidays, including the main day of carnival. Parking will cost 0.75 euros per hour. All schedules can be found on the website www.titsa.com, or on the TITSA telephone number 922.53.13.00 and through the company's social networks.